« Palmantier's Motel saved and open for business! The Illinois Lincoln Highway Coalition announced the completion of its newest Interpretive Mural along the 179-mile byway corridor: 127 N. Third Street in Malta, Illinois, on the Malta Historical Society’s Old Town Hall. 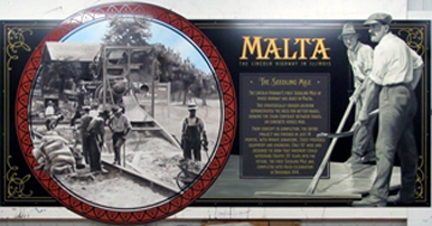 The Malta mural showcases the Lincoln Highway’s first Seedling Mile with a detailed painting of workmen pouring the concrete from a steam-operated mixer and a view at right of men smoothing the surface. The LHA used Seedling Miles to demonstrate the advantages of concrete over dirt surfaces in hopes that it would inspire further road improvements. For more information on the Illinois Lincoln Highway Coalition, including its murals and gazebos plus places to see and things to do, or to download an ILHC’s 2010 Visitor Guide, visit www.drivelincolnhighway.com/. This entry was posted on October 26, 2010 at 12:33 pm and is filed under highways, history, Lincoln Highway, Road trip, signs, transportation, travel. You can follow any responses to this entry through the RSS 2.0 feed. You can leave a response, or trackback from your own site. Another fine article about the happenings along the Illinois Lincoln Highway. Hope all is well with you. As for me, I’m loving retirement!